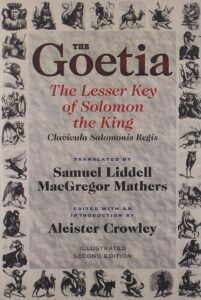 The Goetia (pronounced Go-EY-sha) is Book 1 of the Lemegeton (Lesser Key of Solomon), a grimoire that circulated in the 17th century and is penned in the name of King Solomon. This translation/compilation comes from SL MacGregor Mathers in 1904. Many of the demons found in the Goetia were initially published in the 16th century by Johann Wier. Curiously, a handful were left out. The Goetia also uses some of Collin de Plancy’s Dictionnaire Infernal illustrations. Article: Shem haMephorash – Details how the demons of the Goetia may be associated with the 72 names of God, with an overview of how Kabbalists calculated that number. Excerpt: Nature of Spirits in the Goetia – An excerpt from the Goetia describing the nature of the spirits.